A form called frmPetSimple to view or edit pet details. Write code in the Open event of the form so that it appears restored rather than maximised when it is opened. Open the relevant form (depending on the button clicked). 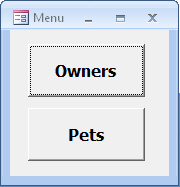 Attach code to the Close event of each of the input forms, so that when either form is closed, the main menu becomes visible again. Check that the system works, then save and close all the forms.